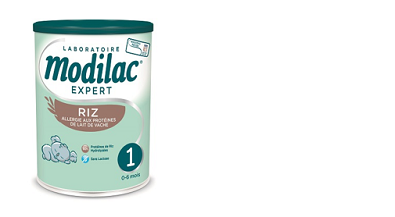 The Modilac brand develops and sells a complete range of infant formulas in French supermarkets and, under the Modilac Expert brand, in pharmacies. 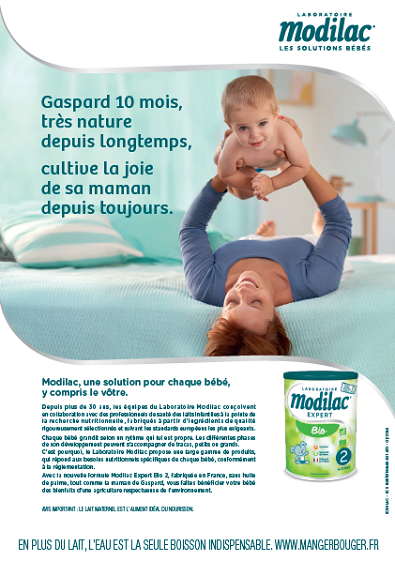 For the last 30 years, Modilac has been developing increasingly innovative, high-quality infant milk formulas. It works according to the belief that breast milk should always be seen as the benchmark. When developing its products, Modilac works closely with scientific experts in infant nutrition, especially in the establishment of clinical trials, to meet daily the specific needs of babies and toddlers, from 6 months, according to the regulations. Modilac, a specialist in nutrition, is offering a full range of infant milk formulas to meet daily the specific needs of babies and toddlers. The brand also produces a range of infant cereals to introduce babies to new flavours and guide them as their diet diversifies. In 2016, Modilac launches a Bio range to meet all the needs of consumers. For baby allergic to cow’s milk proteins, the diversification is delicate. This is why Modilac has designed a milk-free, lactose-free and gluten-free dessert made from hydrolyzed rice protein, with vanilla or cocoa flavor. My 1st dessert without milk is a unique product on the French and international market, and is sold exclusively in pharmacy. the brand leads the cow’s milk allergy segment. Modilac has ambitions to continue developing. Modilac created the Modilac Club, a community bringing together and accompanying parents in their family life choices by sharing tips and advice tailored to the stage of pregnancy or the baby’s age, and sharing reductions, discount and gift codes or recipes adapted to the needs of future mothers and babies. With its delicate crème-fraiche flavour beneath a soft white rind, shaped like a sweet in its distinctive blue box and its name suggesting a special treat, Caprice des Dieux has been winning over each generation since it was created in 1956. A heavenly seductive power!